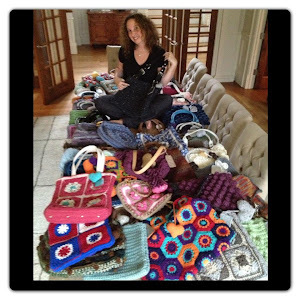 Size: One size fits most, squares can be made smaller or larger for your size. 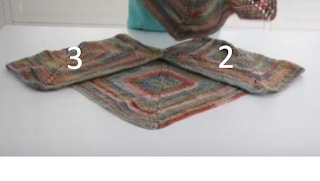 Round 1: ch3, in the magic circle make another dc omitting the last step, you will have 2 loops on your crochet hook, repeat that again making another dc in the magic circle omitting the last step, you will now have 3 loops on your hook, yo and through all the loops on your hook, You just made your first Petal, *ch5, make dc in the magic circle omitting the last step 3 times, you will have 4 loops on your hook, yo and pull through all loops, ch2, in the magic circle again make a dc omitting the last step 3 times, you will have 4 loops on your hook, yo and pull through all loops,* repeat from *to* twice more, finish your round by making ch5, in the magic circle dc omitting the last step 3 times you will have 4 loops on your hook, yo and pull through all loops, ch2, sl st with the top of the first Petal you made. Round 2: sl st your way to the ch5 space, ch3, make dc omitting the last step 2 times in the ch5 space, yo and pull through the loops, ch2, in the ch5 space dc omitting the last steps 3 times, yo and pull through all the loops (your first corner made) *ch2, in the ch2 sp from the previous round you will make 3dc, ch2, in the next ch5 space make dc omitting the last step 3times, yo and pull through all the loops, ch2, in the same ch5 space make dc omitting the last steps 3 times, yo and pull through all the loops, * repeat from *to* around ending the round with ch2, in the ch2 sp from the previous round you will make 3dc, ch2, sl st at the top of the first corner petal you made. Round 3: sl st your way to the ch2, ch3, make dc omitting the last step 2 times in the ch2 space, yo and pull through the loops, ch2, in the same ch2 space dc omitting the last steps 3 times, yo and pull through all the loops *ch2, in the ch2 sp from the previous round you will make 2dc, dc in top of each dc across, 2dc in the next ch2, ch2, in the next ch2 between the petals make dc omitting the last step 3times, yo and pull through all the loops, ch2, in the same space make dc omitting the last steps 3 times, yo and pull through all the loops, * repeat from *to* around ending the round with ch2, in the ch2 sp from the previous round you will make 2dc, dc in each dc across, in the next ch2 sp make 2dc, ch2, sl st at the top of the first corner petal you made. Your finished granny will be approximately 17 inches. You can make your granny smaller or larger by making less or more rounds but remember by doing so the opening of your neck will be smaller or larger. 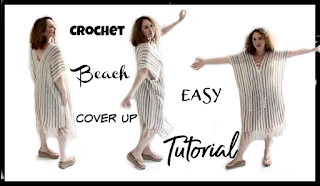 After you assemble the 4 grannies I will show you how I made mine smaller. Hide all loose tails to the wrong side of your squares. You will assemble 1 with 2 and 1 with 3, starting with 1 and 2 place them right sides together. With your yarn and hook you will now join the squares together, making sure they are right sides together, starting at the ch2 in between the corner petals, picking up the back loop in the granny that is closest to you and picking up the loop that is furthest on the other granny, you will want to match st for st as you assembly these 2 squares. Remember not to make your slip stitches too tight and not too loose. Once you have assembled 1 and 2 now it is time to repeat the same for 1 and 3, putting right sides together and sl st together. Making sure that when you are done your work will be joined and lay out like the pic above. 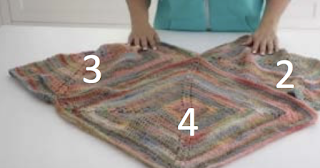 You will sl st the same as you did for the other squares assembling 3 with 4 and 2 with 4. Making sure wrong sides are facing you, join them the same way you sl st the first 3. Now that your poncho is assembled you will hide all loose tails in the wrong side of your work and turn it right side facing you. You will now work on the neck opening to make it smaller, if you like the size it is leave it and you are done, but if you want to decrease the opening continue below. Round 1: With the right sides facing you, with your hook and yarn join with a slip stich to any of the dc of the neck opening, ch1, sc in the same st, sc in each and every dc that presents itself to you, until you reach the ch2 space, you will make 1 sc in it and sc in the petal of the corner, in the next 2 st you will decrease them, sc2tog, you will now sc along in each dc until you reach the next ch2sp, repeat making a sc in in the ch2 sp, sc in the petal and in the next 2 st sc2tog, sc in each st until you reach the ch1 you made (do not sl st you will work in rounds. Round 2: make a hdc in the next st, place a st marker on the hdc to mark the beginning of your round, hdc in each st until you reach the v part of your collar, you will again decrease 2 st hdc2tog, hdc until you reach the next V part of the collar and hdc2tog again, hdc until you get to your st marker. Repeat round 2 for as many rounds as you like I did mine until I had 5 rounds of hdc, sl st with the next st and fasten off, hide all loose tails in the back of your work and you are all done my friends. 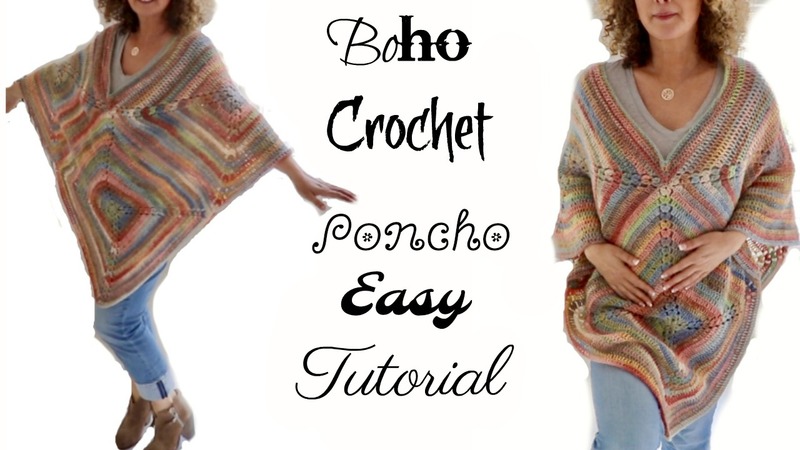 You just created a beautiful light weight Boho Poncho!